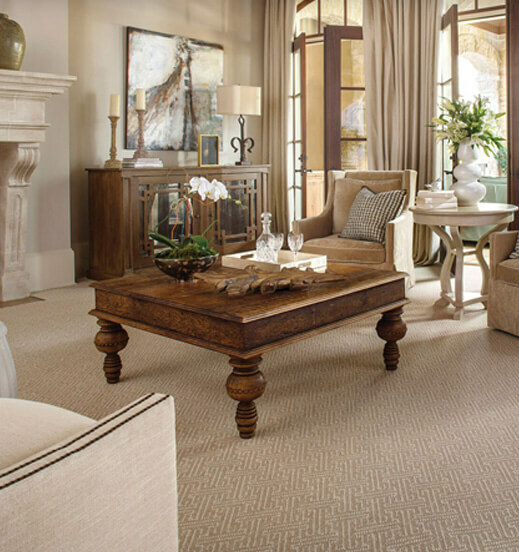 Choosing the right size area rug for your home is important. There are many things to consider. Do you want your furniture to overlap the rug, or would you like to nest your rug in the center? What about shapes, how will they compliment your decor? When choosing a rug for your home, begin with the dimensions of the room and consider the furniture and its positioning. A photograph of a room can be very helpful if you bring it to your flooring retailer. Your salesperson can visualize your home, and provide you with valuable input. Using masking tape or newspaper to outline where the rug will go can be a helpful tool for visualizing the final effect. Take paint chips and fabric samples you have with you when you purchase rug or carpet. All rugs are sold as cut sizes, which means what the industry refers to as an ‘8×10’ might actually be a ‘7’6×9’6’. Always take into account the actual size of your rug, especially in dining settings, those extra few inches can make a big difference. When choosing a rug for a bedroom, room sized rugs should be large enough that you can take a step or two away from the bed and still be on the rug. In rooms with two beds, especially children’s rooms, a rug looks perfect centered between the two. Living spaces are the most versatile, as they are generally the largest, most open space in the home. Keep in mind furniture, and the rooms ultimate purpose – comfort! Consider thinking “outside-the-box” – almost any shape can be effective in a living space. Room and table size are both important when purchasing a dining room rug. There must be 18-24 inches of rug on all sides, so that chairs remain on the rug as people push back from the table. Ovals lend themselves to dining arrangements. Kitchens are perfect for shapes. Rounds, octagons, free forms and any design with interesting borders help define the space. If you frequently entertain, make sure to get a rug large enough to accommodate any extra leaves for the table. Don’t forget to take into account the other furniture in the room, such as buffets or cabinets. Finally, one of the most comprehensive ways to tie your home together is to choose a shape or runner in a hall or entrance way that coordinates with your living or dining space. Stair runners make a dramatic and elegant statement for arriving guests and can coordinate with area rugs, shapes, or wall to wall broadloom.